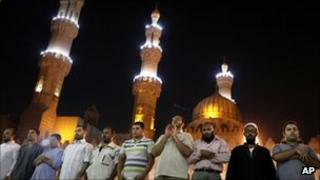 Image caption Nine out of ten Egyptians are Sunni Muslims but support for Islamist parties is hard to calculate. Egypt's Muslim Brotherhood is widely seen as the most formidable contender in parliamentary elections due in November, but its transition from banned opposition movement to bona fide political party has not been easy. Since the country's uprising it has had to deal with divisions in its ranks and new challenges from Islamist rivals. And there is persistent scepticism about its political ambitions from Western powers and some ordinary Egyptians. At their headquarters in Cairo's al-Menial neighbourhood, opposite the Nile, a large blue banner announces the 'Freedom and Justice Party' - the Brotherhood's new political body. Previously, there was no signage whatsoever. Upstairs, Essam el-Erian, the party's deputy vice-president, is hard at work but in high spirits. He stepped down from the Brotherhood's 16-member Guidance Council to take up his new role. "We're preparing for the elections. We're getting ready to choose our candidates and train them," he says. "All our life we have been working in the political arena so we have a lot of experience. During the isolation and restriction of our activities, we were still the biggest political opponents to the regime. Now we are a legal party." It has announced that it will run in half of the parliamentary seats, aiming to win 35% of the total, and is building strategic alliances with other parties, including liberals. "We are not targeting a majority. We are working in a wide coalition. The Egyptian people must see the main streams represented in the parliament: Muslims, Christians, men, women, youths and elders, liberals, leftists, nationalists and Islamists," says Mr Erian. Though the Brotherhood disavowed violence in the 1970s, and represents a relatively moderate brand of Islam, the group is trying hard to counter concerns about an Islamist takeover. "We have learnt from the lessons of Hamas," says Mr Erian, referring to the victory of the organisation's offshoot in the 2006 Palestinian elections, which alarmed the West and led to funds being cut off. "There will be good co-operation with all the international community." The charity and education work of the Muslim Brotherhood have helped it build a national network of grassroots support. But the group's hierarchical structure and dogmatic leadership style is grating on some younger Brotherhood members. In a small, bare office in central Cairo, I meet several activists who took part in the 25 January uprising as members of the Muslim Brotherhood youth movement. Following the ousting of President Hosni Mubarak, they took part in protests to push Egypt's interim military rulers to make reforms - although the Brotherhood withheld its support. And they set up their own party, Egyptian Current, disobeying orders not to compete with Freedom and Justice. The moves got them expelled from the Brotherhood. "[The Brotherhood] leaders didn't catch up with the revolution and they have old solutions. They're not speaking about new political ideas," says Mohammad Shams, who joined the Brotherhood at university, seven years ago. "Their organisation is centralised. Our new one is built on participation and democracy. We respect diversity. We want to replicate what we saw in Tahrir Square with different groups collected together offering practical solutions to Egypt's problems." Mr Shams admits that he is angry at being thrown out of the Brotherhood. "I still believe in its ideology and values", he says. "I wish it could be a kind of umbrella for different parties". The founders of Egyptian Current not the only ones to break off from the Muslim Brotherhood. In May, former Guidance Council member Abdul Moneim Aboul Fotouh, a popular reformist, said he would run for president as an independent. Other high-ranking members left to set up the Renaissance, Peace and Development and Leadership parties. For now, such offshoots are probably too small and new to compete with the Brotherhood's party. Under a new law, a political party needs 5,000 signatories from 10 of Egypt's 29 governorates to register and take part in elections. It is the emergence of other Islamist groups on Egypt's political scene - Salafists, the Islamic Group and Sufis - that poses a greater threat to the Brotherhood. A rally organised in Tahrir Square in late July highlighted widespread support for the conservative Salafi movements. Having previously shunned politics, their leaders recently registered a party called al-Nour (the Light). "The Salafist groups have a lot of support on the ground so I think the Brothers will be trying to co-ordinate with them so they don't clash in the election period," says Omar Ashour, a lecturer in Arab politics at Exeter University, who is back in his native Egypt conducting research. He says the Brotherhood may also be interested in "some kind of deal" with the Islamic Group, because of its popularity in parts of Upper Egypt, along the southern reaches of the Nile. Once classed as a terrorist organisation, the Islamic Group has seen most of its top members released in the past few years after they renounced bloodshed. Brotherhood officials say they are offering to share the experience of their 83-year-old organisation with political newcomers provided they reject violence and extremism and act lawfully. However Mr Ashour questions how influential the Brotherhood can be as a moderating force on its more radical rivals. "Salafist factions only look at their own leadership and theologians. They see the Brotherhood as second rank," he says. Mr Ashour predicts an internal struggle that will determine whether the Brotherhood draws closer to secular parties or more puritanical Islamist groups. "We have to see which factions will dominate within the decision-making process," he says. Egypt is a socially conservative country where 90% of the population is Sunni Muslim. Most women wear the hijab, or headscarf, and the mosques are often crowded. However what is not known is how this will affect voting behaviour in a state where past elections were dogged by vote-rigging and voter apathy. People's preferences have never been truly tested before. In Islamic Cairo, the ancient heart of the capital, many locals describe themselves as observant Muslims, but object to the notion of religious parties taking control. "Let me tell you something, if a sheikh [religious leader] rules Egypt, women will have to wear the niqab [the full face veil] and it will be forbidden to shave your beard," says Mohammad. "This is not what the Egyptian people are about. Religion is a personal choice". His friend, Mohammad Mustafa, says he too would never vote for a sheikh. "I wouldn't be allowed to watch what I want on TV," says Mr Mustafa. "If my wife had to work after 10pm, they would make me stop her from working. We don't want all that. We want freedom." Analysts say as much as three-quarters of the Egyptian electorate is "non-ideological". It is this silent majority that any political party - Islamist or secular - will have to target to win significant numbers of parliamentary seats. If the democratic process continues, it could yield some surprising results.